JUBA, Mar 14 2012 (IPS) - It is late afternoon and a group of men and women begin to converge under the shade of a huge mango tree in Yambio town, the capital of South Sudan’s western Equatoria state. The group is not gathering for an ethnic, political or religious meeting. They are here to listen to the radio. More specifically, they are here to listen to a community-based civic education programme on their local community station called Let’s Talk. It targets communities, and their leaders, to help promote dialogue on South Sudan’s political transition to an independent and democratic country. And it introduces listeners to civic topics ranging from South Sudan’s transitional legal framework to strategies for combating corruption, and protecting children’s and women’s rights. The 30-minute programme first hit the airwaves in January 2007 and uses a magazine format that includes drama, group discussions, and interviews to get its message across. “The drama is used as a teaser segment that weaves rather complex issues or topics into the lives of characters in a fictional South Sudanese town of Jedida in a manner that is simple, humorous and more palatable to the audience. It helps ensure that the audience is entertained and informed about the topic of the day, but on a lighter note with lots of humour,” said Rehema Siama, Sudan Radio Service’s (SRS) scriptwriter for the programme. Let’s Talk was created through a partnership between the National Democratic Institute (NDI) and SRS. It is broadcast in English, Arabic, and the two local languages of Dinka and Nuer. The programme is aired on a host of community radio stations including Sudan Radio Service, Bakhita FM, Radio Emanue, Naath FM and Nhomlau FM. Today’s broadcast is an old one about defining free and fair elections. However, it has sparked the listeners’ apprehensions about a leader’s responsibilities. In addition to the programme, the NDI organises “listening groups” of ordinary people who gather across the country to listen to the programme and discuss its topics and themes and the impact on their communities, just like the group in Yambio. “The session is intended to encourage democracy. If you get people together and they are able to tolerate each other’s views we believe it encourages democratic principles. We believe, in this way, people will learn to dialogue rather than to use violence to sort out issues,” said James Amuda, a programme officer at NDI. – South Sudan is using radio to disseminate information on legislation and educate the public on civil topics. 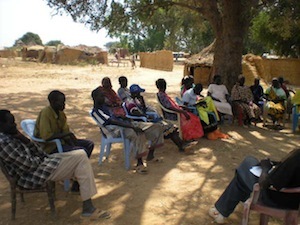 Charlton Doki reports that the community-based civic education programme, Let’s Talk, targets communities to help promote dialogue on South Sudan’s political transition to an independent and democratic country. After the broadcast in Yambio, James Gbakilingba, a listener in the group, talks about his concerns about the right to express one’s political views. “For me, it is important that we talk to the people about political parties. We need to inform them what the views and objectives of each party are. And we need to inform people that the law allows anybody to belong to a party of his choice,” he said. South Sudan is considered one of the most under-developed places in the world. And given the country’s vastness and biting poverty, coupled with its low level of literacy, radio is the surest way to reach the population. In a country as remote as South Sudan, where there are only a few paved roads and many places can only be reached by air, and the airwaves, this community radio programme has been a hit. The programme is also helping disseminate information on new laws such as the Child and Land Acts. It is helping citizens to understand their roles in an independent country, Amuda said. NDI has partnered with Free Voice Media to produce a new series of Let’s Talk. Marvis Birungi, a journalist involved in editing the features segment of the new programme, said there is still a need to address the information gap about the processes of democracy. During last year’s review of South Sudan’s Interim Transitional Constitution, the Let’s Talk programme producers interviewed members of the technical committee to explain the review process and the role of citizens in it. SOUTH SUDAN: A Country Split – But What Happens to the People? “So this programme will create awareness about the transitional constitution. Listeners will get to know the contents of that document. In addition, we know that a permanent constitutional review commission for the permanent constitution has been appointed, but the public need to know how they will participate in the review process,” Amuda said. The new series will be piloted before the end of this month on four community radio stations: Radio Emmanuel in Eastern Equatoria state, Good News Radio in Lakes state, Radio Jonglei in Jonglei state, and Bakhita Radio in Central Equatoria state. It will include a feature story, a short drama, a discussion segment, and a long interview with an expert or somebody who is knowledgeable about the particular topic. “We know at the moment that the constitution contradicts certain customary laws. For example, the constitution says a woman has the right to have all the wealth of her dead husband but customary laws contradict this. So we will find someone knowledgeable about the constitution and somebody from the community with a cultural perspective, and they will discuss these issues,” said Amuda, about the new programme. *This story was produced with the support of UNESCO.